If you have never had a tamale before you might not know that they are literally one of the tastiest, economical, and healthy breakfast, lunch, or late night snacks that is out there. One of the things that I love about Mexico is that the “fast food” is in the hands of the community. Easily obtained from markets stalls, roadside stands, folks that ride mopeds honking through neighbourhoods much like an ice-cream truck, on buses, and of course in every grandmothers kitchen. 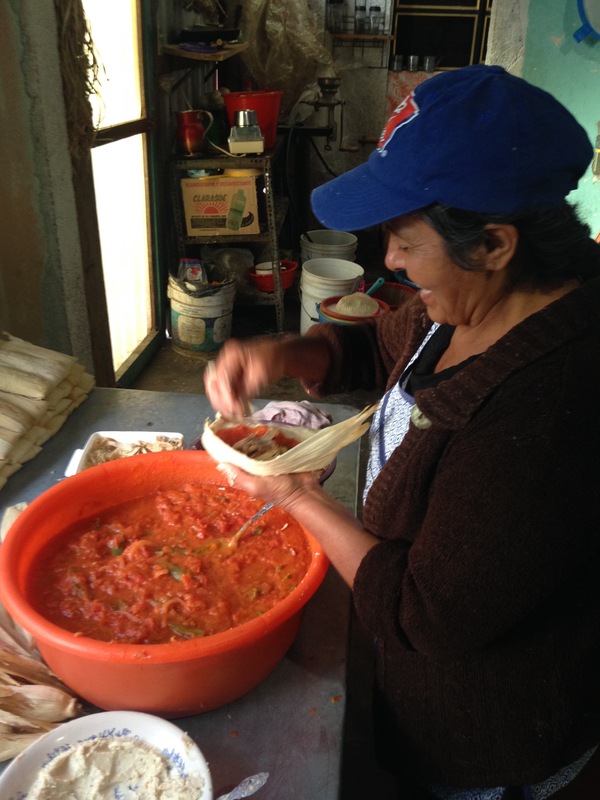 Tamales are Mexico’s answer to the munchies – though always homemade and created from pure and nutritious ingredients. 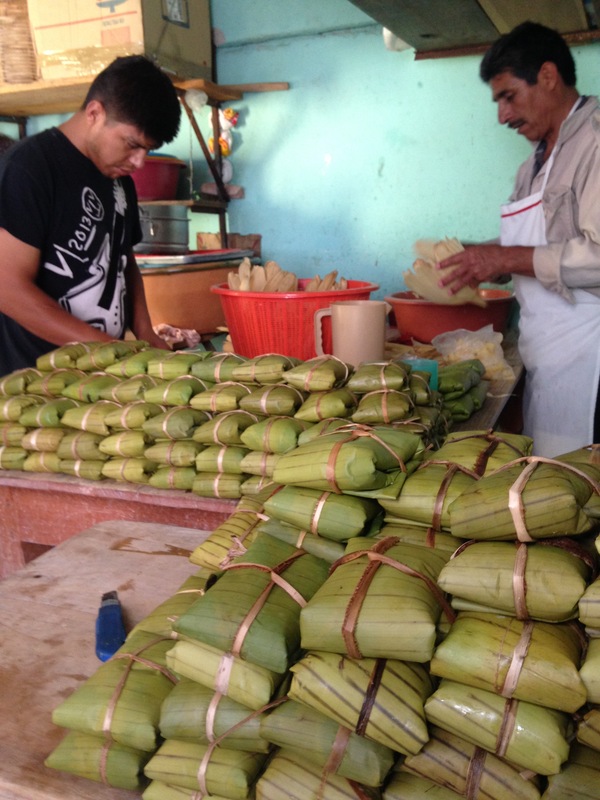 Tamales are fragrant and varied, sometimes wrapping the homeny dough in corn husks and while other varieties are wrapped in plantain leaves. 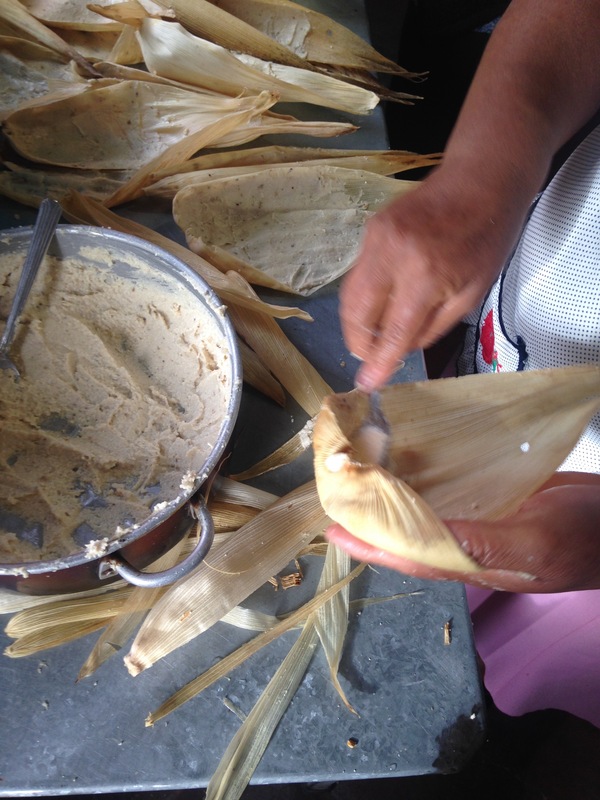 The paste like dough is called masa, and is made from a variety of corn that is dried and ground for the tamale. Some tamales hold sweetened masa and others hold a saucy centre. Tamales sauces can, for example, be a mole or a green or red sauce with meat…the possibilities and varieties of flavour are really actually endless. The family with whom I traveled to the country side in the previous post, live in Oaxaca City, and like many hardworking folks they have multiple ways of cobbling together a living, which for them includes their very own tamale business. Every week this family dedicates Thursday evening to Saturday morning making 800 tamales that they go and sell every Saturday afternoon and Sunday. 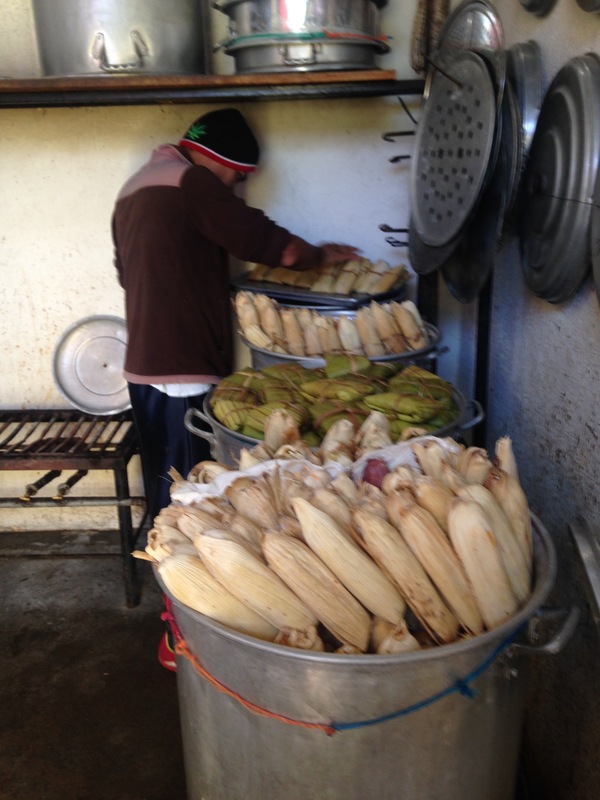 From a simple cement building attached to their home this family begins the process of soaking, cooking, and preparing the corn masa that makes the base for the tamales every Thursday evening at about 5pm. Earlier that day, the fillings for the 8 different varieties that they produce have already been started so that they are cooled and ready to use when the assembly begins. At 2am (yes – 2am) this family meets and begins making these tiny packages of love, a job that continues through until early evening. 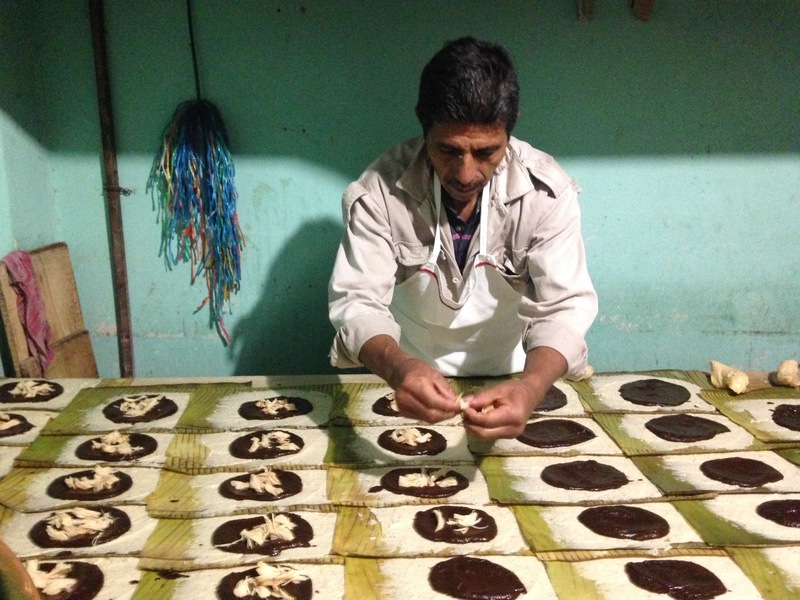 Like a well oiled machine, each member of this tamale team has a special job, with the expertise of the entire enterprise resting on the matriarch of the home. What I learned…tamales are all about technique, and controlling a mountain of variables including how warm the masa is when spreading it on the leaves or husks; real tamales are made from scratch – the spices are dry roasted before being ground and added, the dry corn is soaked and cooked and milled immediately before use – in short there are no short cuts and the difference is felt and tasted; I learned to imagine a world in which grabbing a quick bite could be another way to engage in the traditions of the community and support the survival of its members. There is no reason that we need to hand over the solutions for the very basic of human needs of sustenance to large for profit corporations. There are as many models as there is imagination for how we can meet our needs for food, whether it is a quick bite or a formal meal, and in the process of satiating hunger, support the economic livelihoods of the members of a community, eat healthy traditional food, and live low to the ground and in harmony with the land. I don’t have any recipes to offer this week. If you want to learn how to make a tamale I recommend going to Mexico, and if you have never tried one and your not in Mexico I recommend going to the local flea market or just the part of town that there are latin stores and asking around. You will be hard pressed to find someone making the masa from scratch instead of the maseca version that requires on to add water to a pre-made mix, but start there! First the dried hominy is soaked in water (much like dried beans are). Then it is cleaned through rinsing and straining it several times. Lime is added to the cooking corn so that our bodies can digest it. It was this small detail (or lack of knowledge of it) that killed so many of the earlier colonizers. After it is finished cooking the hominy corn is ground. In addition to a small amount of salt, pig lard is added to the masa to bring lightness and flavour to it. All 7 of the different sauces that filled the tamales was made from scratch. The bean filling was made rich and velvety from cooking with avocado leaves among other spices. Next Next post: With the Mexico Adventure Complete…What’s Next? !